Oksana Parafeniuk lives in Kyiv. Participated in several exhibitions in Ukraine. Hew work was published in The Eye of Photography, Bird in Flight, Ukrainian Truth and other publications. She currentyly studies for her Master’s majoring in French language and culture at Middlebury College. 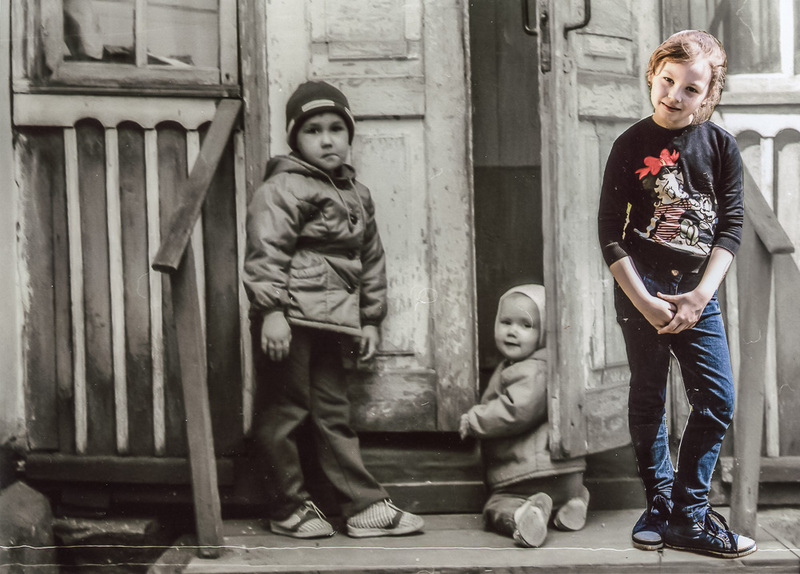 I open the big wooden box of old family photographs and carefully pick ones taken more than twenty years ago in the town of Korostyshiv, one hundred kilometers west from Kyiv, Ukraine. For me it is a place of very intimate family and memory attachment. My mother was born there. It has always been a place where our family members would gather, sit around the table and tell stories from our family history. Korostyshiv is where my roots are, where I spent a lot of time thinking about memory and connection to the place, and the importance of handing down family reminiscences and significant events from generation to generation. Since the beginning of the war in eastern Ukraine, there are over one million internally displaced persons. One day, I read online that a group of displaced people settled in an old summer camp in Korostyshiv, only ten minutes’ walk from our house and the camp that I have known since my sister and I were little. Imagining these families in an environment that I know well, yet which is entirely new for them, made me think about the detachment from one’s own memory, your place, about the loss of everything full of meaning, and about the difficulties of settling in a new place and not being able to return to your home. I found a family from a little town in Luhansk region, who fled the war in the summer of 2014 and now live in this camp in Korostyshiv. I immediately felt a strong connection with two sisters Liliia and Iuliia, and Iuliia’s daughters Ania, 10, and Nastia, 8. I also grew up with my younger sister. They shared memories of how they spent time with their grandparents in the country house, and they also talked about their own big wooden box with old photographs, some of which they could only bring to Korostyshiv recently. I wanted to spend time with this family, sharing our memories and stories, in order to help them develop connections to Korostyshiv, seeding a foreign environment with personal tales, and to hear more about their own lost history. At a time when there are so many displaced people in Ukraine, this project is a way to explore the meaning of place as it pertains to memory, and how the loss of access to a place affects one’s memories. It is also a way to look how layers of history and identity shape our lives and our interaction with the new environment. 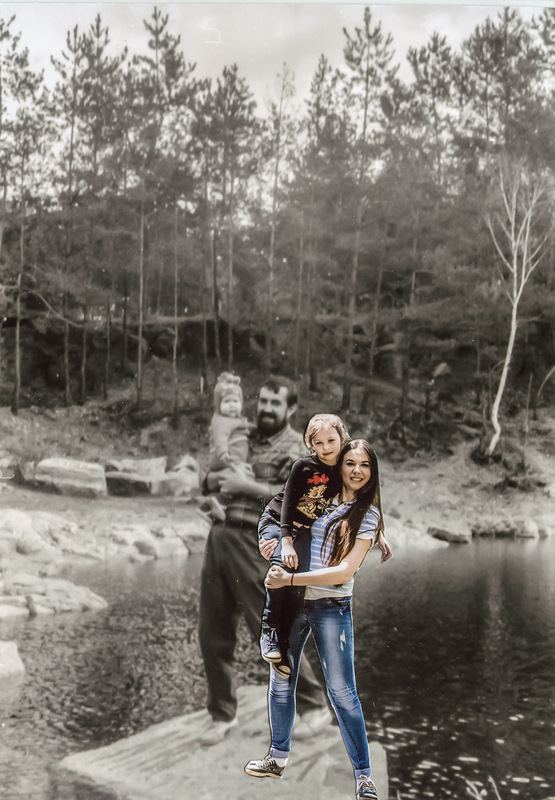 I photographed the family on a summer day, their poses mirroring the old black & white photos taken by my parents, in the very same places in Korostyshiv. 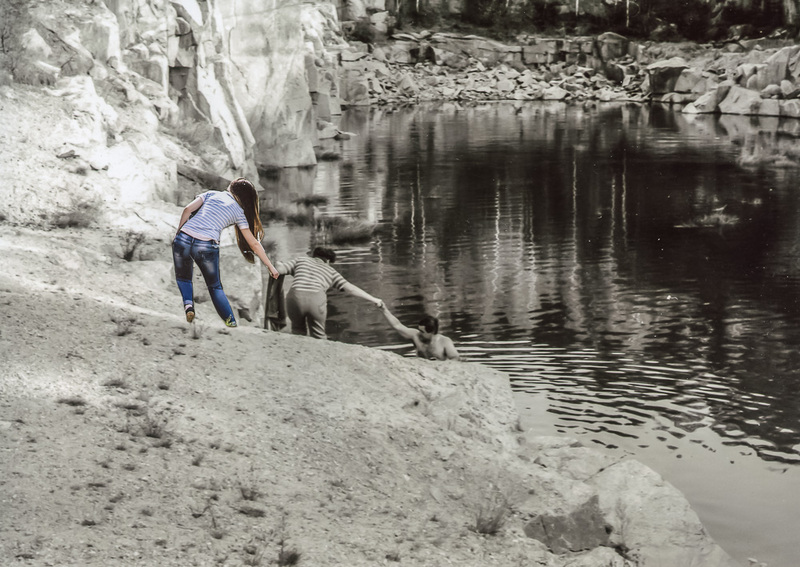 It is a collaborative attempt to create a modern family album, combining our memories from different times. The collages are done in a rather childish manner, as childhood memories are often the strongest. In the end, it became a personal exploration of my roots and a meditation on the possible detachment from everything that is my foundation in life.